Orcadian student wins Scotland-wide competition, marking Scotland’s Year of Innovation, Architecture and Design . An Orcadian student is set to have her winning competition designs brought to life after wowing judges with her range of contemporary jewellery, inspired by one of Scotland’s Neolithic sites. 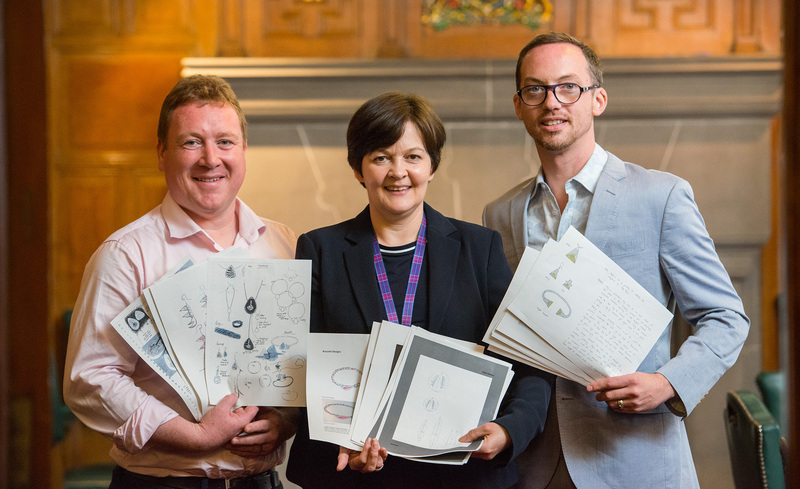 Historic Environment Scotland partnered with Orkney-based jewellery manufacturer, to challenge students across the country to design a range of jewellery inspired by Maeshowe Chambered Cairn. Entrants were asked to draw on the different features of the 5,000 year old Orkney site, and its past, to help inspire their designs for the chance to have their creations manufactured and made available to purchase in gift shops and online. Local Orcadian and Fine Art Textiles student, Norna Sinclair was named by judges as the overall winner. 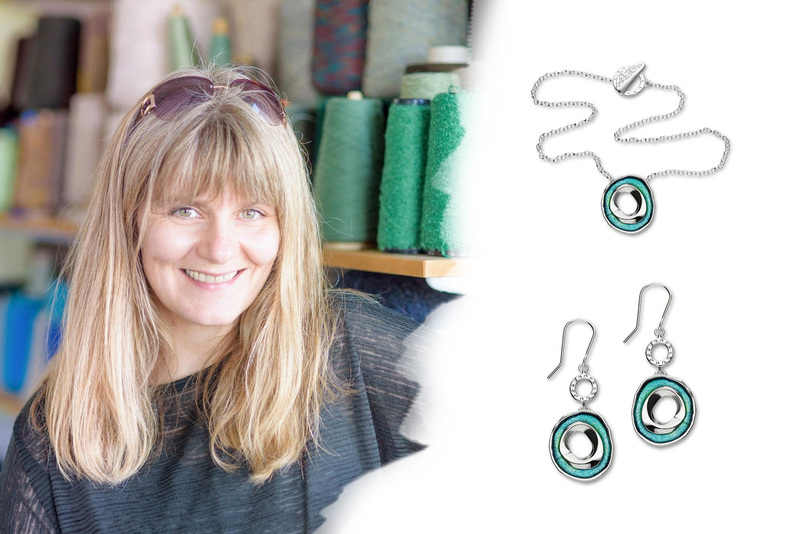 Representing the heritage and historical landscape of the site, her designed range – which includes a necklace, bracelet, ring and earrings – uses the circular bird’s eye view and archaeological field survey drawings of Maeshowe for its main inspiration. Sinclair drew on other aspects and features from the local surrounding landscape through the use of coloured enamels and was inspired by the Barnhouse Stone, incorporating this into her earring design as well as necklace and bracelet fastenings. Judges, including Ortak Managing Director, Michael Gardens, Director of Scotland Re:Designed, Chris Hunt and Historic Environment Scotland’s Kari Coghill, also named Glasgow-based student Paula Hutchinson as runner up for her pendant design inspired by the Viking dragon stone carving within the tomb at Maeshowe. Judging panel of the Maeshowe Jewellery Competition chaired by Kari Coghill, HES, Michael Gardens, Ortak Jewellery and Chris Hunt. Kari Coghill, Head of Business Development and Enterprise at Historic Environment Scotland and member of the competition judging panel, said: “The standard of design entries was incredibly high and it was fantastic to get a real insight into the emerging design talent within Scotland. “Whilst judging wasn’t an easy task, we were particularly impressed with Norna’s innovative approach and it was great to see how she used an archaeological field survey drawing of Maeshowe to spark her creative process. Across the board the design submissions were so strong that we decided to select a runner up and chose Paula for her necklace design, based on the Maeshowe Viking dragon stone carving. These pieces form a unique collection that represents Maeshowe and Scotland’s historic environment in a contemporary and simplistic style. Currently being manufactured by Ortak, the jewellery will sit alongside other collections and be available to buy in gift shops at Skara Brae and Edinburgh Castle, as well as online from early next month. Helping to celebrate Scotland’s Year of Innovation, Architecture and Design, the competition was open to students studying art, design and creative industry related degrees. With the initiative attracting entries from aspiring designers from Glasgow and Edinburgh to the Highlands and Orkney.